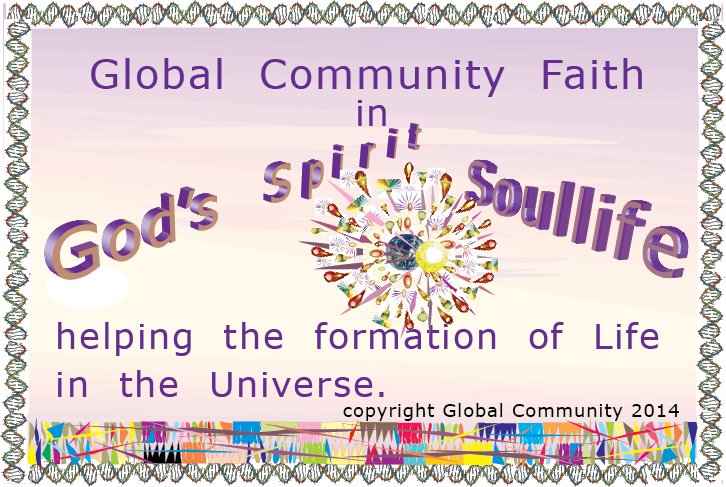 Global Community Faith in God's Spirit, SoulLife, helping the formation of Life in the Universe. The author, Germain Dufour, was educated in a small french Canadian town called Sorel. His religious education was based on the Roman Catholic Church doctrine on faith and morals that it presents as definitive and infallible. The Church's hierarchy is headed by the Bishop of Rome, known as the Pope, who is the leader of the worldwide Catholic Church composed of the Latin Church and the Eastern Catholic Churches in full communion with Rome. The Church holds that Christ instituted the Papacy, upon giving the keys of Heaven to Saint Peter. Catholic doctrine has evolved over the centuries, reflecting direct teachings of early Christians, formal decisions of heretic and orthodox beliefs by Ecumenical Councils and Papal Bulls, and theological debate by scholars. The Church believes that it is continually guided by the Holy Spirit as it discerns new theological issues and is protected infallibly from falling into doctrinal error when a firm decision on an issue is reached. The doctrine teaches that there are two sources of revelation: Sacred Scripture and Sacred Tradition, and that these are authentically interpreted by the Magisterium. Sacred Scripture consists of the 73 books of the Catholic Bible, consisting of 46 Old Testament and 27 New Testament writings. The New Testament books are accepted by Christians of both East and West, with only those who follow Luther putting them at three different status levels. The Old Testament books include some, referred to as Deuterocanonical, that Protestants exclude but that Eastern Christians too regard as part of the Bible. Sacred Tradition consists of those teachings believed by the Church to have been handed down since the time of the Apostles. Sacred Scripture and Sacred Tradition are collectively known as the "deposit of faith". These are in turn interpreted by the Magisterium , the Church's teaching authority, which is exercised by the Pope and the College of Bishops in union with the Pope, the bishop of Rome. Catholic Doctrine is authoritatively summarised in the Catechism of the Catholic Church. The doctrine section of the Catechism is organised according to the Apostle's Creed. The Church also accepts the Nicene Creed. The Catholic Church holds that there is one eternal God, who exists as a mutual indwelling of three persons: God the Father; God the Son; and God the Holy Spirit, which make up the Trinity. Catholics believe that Jesus Christ is the second person of the Trinity, God the Son. In an event known as the Incarnation, through the power of the Holy Spirit, God became united with human nature through the conception of Christ in the womb of the Blessed Virgin Mary. Christ therefore is both fully divine and fully human. It is taught that Christ's mission on earth included giving people his teachings and providing his example for them to follow as recorded in the four Gospels. The Church teaches that through the passion (suffering) of Christ and his crucifixion as described in the Gospels, all people have an opportunity for forgiveness and freedom from sin and so can be reconciled to God. The Resurrection of Jesus gained for humans a possible spiritual immortality previously denied to them because of original sin. By reconciling with God and following Christ's words and deeds, an individual can enter the Kingdom of God. The Church teaches that God the Holy Spirit , God's Spirit, "proceeds" from God the Father and God the Son as a single origin, a belief generally accepted in Western Christianity and expressed in the Filioque clause added to the Latin version of the Nicene Creed of 381, but not included in the versions of the Creed, not derived from the Latin text, that are used in Eastern Christianity, including the Eastern Catholic Churches. The Book of Revelation, often known simply as Revelations or the Apocalypse, is the final book of the New Testament and occupies a central place in Christian eschatology. Revelation makes use of symbolism and visions, mentions angelic mediators, has bizarre imagery, declares divine judgment, emphasizes the Kingdom of God, prophesies new heavens and a new Earth, and consists of a dualism of ages, in other words a present world and a world to come. In terms of being prophetic, the author of Revelation uses the words: prophecy, prophesy, prophesying, prophet, and prophets twenty-one times in these various forms throughout the text. No other New Testament book uses these terms to this extent. Most of the interpretations fall into one or two of the following categories: 1) futurist, which believes that Revelation describes future events (modern believers in this interpretation are often called "millennialists"); and 2) idealist, or symbolic, which holds that Revelation does not refer to actual people or events, but is an allegory of the spiritual path and the ongoing struggle between good and evil. The Soul of Global Community. Global commons of Guiding Souls. To be conscious of God. The higher purpose for Humanity. Together we have what it takes to manage Earth responsibly and keep it healthy. E. Guiding Souls to serve God is a part of a new unifying religion of a modern symbiosis global society: Global Community Faith and Religion. SoulLife, the Soul of Global Community. A short summary of theories explaining the origin of Life. Global Community Faith and Religion on the origin of Life. Divine Love and Divine Will helping Life to be formed. Guiding Souls guided the evolutionary process in small ways. Earth management becomes a spiritual and a natural process. F. Is humanity as we know it today on Earth our final destination ? The teaching of the Soul of Humanity. The teaching of the prophet. Golden Rule principle and societal sustainability. Global Justice Movement for all life on the planet. Abolish the business of conflicts and war. Security for all life on Earth. Be actively involved in applying recommendations from the scientists of the Intergovernmental Panel on Climate Change ( IPCC ). I. New Revelations, by God, delivered through Germain Dufour. J. God's Ten Commandments, delivered through Moses. As an introduction to this paper, let us define Faith so there will be no misconception of Global Community's message. Faith is a spiritual force because God's Spirit is SoulLife and helping all Life to manage Earth responsibly. We are sure that God exists, and that God's Spirit is everywhere in the Universe. We are sure SoulLife is God's Spirit. Faith blessed the Global Ministry of Essential Services. Faith trusts God's Spirit makes Global Community religion Holy. Life in Global Community gets turned in God's direction: thoughts, priorities, aspirations, and behavioral standards. Faith trusts and accepts God's Will and God's Word. Faith trusts and accepts the New Revelations by God. 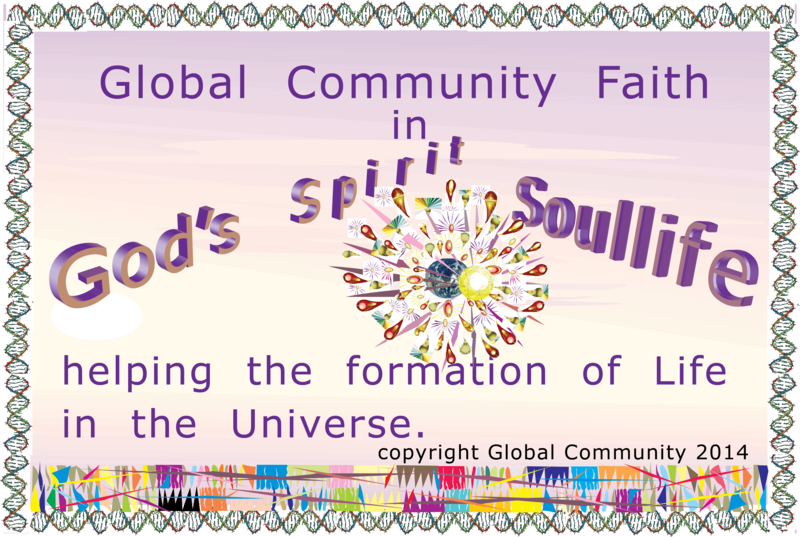 Global Community Faith is embracing the truth that God's Spirit is everywhere in the Universe and SoulLife , being a short name for God's Spirit, is showing the way for the origin of Life. Faith in SoulLife is a commitment to SoulLife 's teaching and New Revelations by God. Global Community Faith is accepting that you dont know and trusting that SoulLife does. Global Community Faith is trusting that SoulLife is God's Spirit, and SoulLife brings Peace in the world. Global Community Faith is Hope and Love. Global Community Faith shows us the way to survival and Peace. Global Community Faith is for everyone to embrace freely. I believe for sure that Global Community Faith shows me the way to God's Heaven, and that everyone can be with God in Heaven. Now let us go on explaining in details what Global Community Faith and Religion are all about. All Souls are independent living beings, and they exist together elsewhere. They don't resemble our physical forms. There is a Soul in everyone of us. Although the same Soul stays with us throughout our Life, the Soul can still be evolving and merging with other Souls. A Soul is a beautiful, wonderful entity who loves us completely. A Soul can have a soulmate. I do! Her physical form died a while ago but her Soul merged with mine, and we are now together forever. We are now one Soul, brighter, different, evolving, serving God and seeking God's Heaven! Souls exist in all spaces and are goal oriented. The one goal common to all Souls is to guide the matter of the Universe towards the creation of Life. Then Life becomes conscious of God. All Life forms, even plants, can be conscious of God. This goal is a global common to all Souls. We could compare it to the force fields of our Universe: gravitational, electromagnetic, static magnetic, electric, electrostatic, etc. We can communicate with our Soul just by listening to our own thoughs, our innerself. Our Soul talks to us all the time. We just need to pay attention and differentiate our everyday thoughts to those of our Soul. Souls dont make decisions for us but they always show us the way, and it is left to us to choose the way of the Soul or not. By extension, the expression Global Community also includes the entire Universe , space and time, all matter, galaxies, dark matter, all particles and all unknown parts of the Universe yet to be discovered. Global Community also includes all Souls, and that makes it different than just saying Global Community is the Universe. So time is truly a global common for the physical Universe , for all Life , as we do observe the passage of time, but is not a global common for Souls. God's Spirit is everywhere at all times, past, present and future. Global commons amongst Souls are peace, truth, justice, doing good, social harmony, love, absolute communications, fluid motion, and Will of God. Although the same Soul would be within a Life -form throughout its Life -span, it is only a viewpoint, Life 's viewpoint, the physical Universe 's viewpoint. Past, present and future dont exist for Souls. What seems a billion years to us is only an instant, an event, a motion for a Soul. The overall picture, the Soul's viewpoint, is still a fluid type of motion and Souls move around as waves and the wind, swirls, interacting gusty winds, in and out	of each other, constantly merging to achieve the ultimate goal of the Soul. Souls exist in all particules and can have an effect on the physical Universe. A Soul shows the way in whatever particule they exist in. A Soul has one very important goal, and it is to show the way toward the creation of Life in the Universe. That is why I referred to them as 'Guiding Souls'. Since time has no meaning to a Soul, the billions of years that it takes to create galaxies, planets, and ultimately Life , can always be achieved. Like an artist painting the Universe making sure that, at the end, Life is expressed on the canvas. Life is the ultimate goal to achieve. Life is the way God has chosen for the physical Universe to be conscious of God. A Life -form with more physical senses has more ways to communicate with the Soul and thus with God. From Life 's viewpoint, the ultimate goal of a Soul is truly to create a symbiotical relationship between God and Life in all its forms. God loves it when Life becomes conscious of God. And Life has achieved its greatest purpose by being conscious of God. I let my Soul to know me and the physical Universe I live in, my environment, and in return, my Soul let me know what it means to be a Soul, and about the other Souls, Beings, Divine Love and Divine Will, and also helps me make contact with God and live a Soul Life. My Soul learns from me, and I learn from my Soul. Souls are much more intelligent then we are and are very creative. We both appreciate each other. Our learning is never lost. We are sharing a lot. This is how I discovered the Soul of all Life , the Soul of Humanity, a wonderful loving Being. The Soul of all Life or Soul of Humanity is a wonderful loving Being made up of the Souls of all Life forms on Earth and the Soul of Earth itself, and by extension the Soul of all Life is the Soul of all Life over the entire Universe. This is what Souls do best, they unify to better serve God. They merge together to better serve God. Souls can evolve as well. They have formed a new Being, the Soul of all Life , also called the Soul of Humanity, to better serve God. The Soul of Humanity is helping to bring about the event of Peace in the world. Knowing that Earth is a spiritual entity as well as a physical entity in space and time in the Universe we begin to have a better relationship with Earth and with all its living inhabitants. This way Earth management will become a spiritual and a natural process whereby each person is responsible and accountable for its management the best they can. Peace in the world and Earth management have for far too long been in the hands of and affected by government and business leaders, in the hands of a few people on the planet, as opposed to being in the hands of all of us working together to keep our planet healthy. We are the keepers of the Earth. Now we all see the place the Earth has in the Universe , and that it also has a Soul. Earth has a Soul just like each and everyone of us. Obviously the Soul of the Earth is different than the Soul of a person, and the Soul of each person is different from that of another person. No two people are the same or have the same Souls. Souls have lived different experiences, have merged and evolved in different ways ever since the beginning of the Universe. Actually, the Universe has always existed and will always exist in some form or other. From our perspective, the Universe is infinite in space and time. The Big Bang theory, if it can be shown to be truth with a 100% certainty, was just a 'blink' within an infinite Universe. Because of the danger of Life extinction on Earth, the Soul of Humanity will be helping us for some time. This makes a lot of sense! If you were a Soul would you prefer to serve God in a dust particle found in the empty space between the oldest galaxies? You would still be with God! But the next particle might be a million light years away. Pitch dark! You could not even see or sense the light of the nearest galaxy. You could not see anything because you would have to be in a Life form or in a particle to do so. Not a very good place to be conscious of God. As a Soul you would still be with the other Souls but you would not taste Life in the physical Universe. Just a particle! Or would you prefer to be on Earth or on any other planet where there is Life. As a Soul you would probably prefer to serve God within a human being or within some other advanced Life form in the Universe. This would allow the Life form to be conscious of God. There is a lot to be conscious of in any Life form on Earth. There is so much more to be conscious of in a human body. Can you believe that every Life form has a Soul? Well, with some differences. God is conscious of all Life forms. For instance, a bird! God is very happy when conscious of flying in our physical Universe. God loves human beings more because we can talk back to God (so God has a friend to talk to), and we are conscious of God (so we have a friend as well). This does not mean we are like God. No way! God does not look like us, and we dont look like God. Not ever! God is an infinite Being covering all of the Universe and beyond. By Universe we mean the billion of galaxies, space and time, and beyond. Life has evolved on Earth, and there we are, the 'top of the line species' (you could challenge this theory as we could have come from another star system). There will be a time when enough people will be able to think together very strongly about Life , and then Guiding Souls will make it possible for us to acquire the knowledge and expertise to travel the distances of the Universe and propagate Life in all its forms. At the moment our civilizations are not ready for the exploration of the Universe. Too many conflicts and wars and not enough peace in the world. To acquire such knowledge would be more destructive than helpful for the propagation of Life. For now the Peoples of our world need to learn to live in symbiosis with one another. Their are many types of symbiotical relationships to choose from. A global symbiotical relationship between two or more nations, or between two or more global communities, can have trade as the major aspect of the relationship or it can have as many other aspects as agreed by the people or nations involved. The fundamental criteria is that a relationship is created for the good of all groups participating in the relationship and for the good of humanity, all Life on Earth. The relationship allows a global equitable and peaceful development and a more stable and inclusive global economy. Global Community has begun to establish the existence of the age of symbiotical relationships and global cooperation. An economically base symbiotical relationship exists between nations of the European Union. Other types (geographical, economical, social, business-like, political, religious, and personal) may be created all over the world between communities, nations, and between people themselves. There has always been symbiotical relationships in Nature, and between Souls and the matter of the Universe to help creating Earth and Life on Earth to better serve God. In the context of the global civilization of the 3rd Millennium we have defined that any symbiotical relationship is for the good of all, for the good of the 'other'. It is based on a genuine group concern and unconditional support for the individual's well-being ~ a giant leap in human behaviour. The question is how can we improve the political symbiotical relationship to fulfill the fundamental criteria? Global Community promotes values and principles to achieve the fundamental criteria and that requires the promoting and establishment of: global community ethics, mutual respect, respect for Life , basic liberties, justice and equity, caring for the 'other', integrity, responsibility and accountability. Other symbiotical relationships may be based on common concerns and issues such as: the environment, peace, justice, women's rights, global rights, and many more. There is a whole spectrum of possible symbiotical relationships. A global symbiotical relationship between nations is more than just a partnership, or an economical agreement such as the WTO. The WTO is about a trade partnership between nations. Of course it is a bad idea to be a member of the World Trade Organization ( WTO). There are no advantages! The fundamental criteria is not being fulfilled. It just does not work for anyone except when you have an army to knock down any member who does not do your five wishes and plus. A membership in the WTO is not needed and nations should instead seek relationships with fewer other nations only if needed. Certainly it is better to seek an economic relationship with another nation we can trust than with hundred nations we have no control on and everyone of those nations has a say in the governing of our nation, its environment and social structure. The WTO only offers illusions to profit the few wealthiest people on Earth. They say "become an industrialized nation as we are". But that is the biggest illusion of all. Industrialized nations have created the global warming of the planet with devastating consequences to all Life. They give jobs to machines as opposed to people and say they are creating jobs while in fact it is just the opposite. To become an industrialized nation is far from being the best solution. The best way and solution for any nation is to follow the Scale of Global Rights . Right on top of the scale are the ecological rights, the global Life -support systems, and the primordial human rights of this generation and of the next generations. Economic and social rights come next and are not the most important. That makes a lot of sense! The effect of IMF and World Bank policies in the world caused the destruction of the economies of the developing nations They impoverished the people by taking away basic services and devaluating their currency. They opened up their national economy to be ravaged by competition with richer nations. Poverty lead to other problems causing the ecological destruction of a developing nation. Global Community is inviting you to participate in the formation of global symbiotical relationships between people, institutions, cities, provinces, communities, nations, and businesses. Global Community is inviting you to participate in the formation of global symbiotical relationships between people, institutions, cities, provinces, communities, nations, and businesses. We are also proposing the formation of a political symbiotical relationship between state and global civil society. A similar relationship already exists between the people of Global Community, also known as the human family, the global civil society. Global ministries are a very specific and useful type of symbiotical relationships on Earth. There are urgently needed. Global Community has been promoting the formation of global ministries for the proper governance of Earth. Global ministries are world wide organizations just like the World trade Organization (WTO) for trade and therefore should have the same power to rule on cases as that of the WTO. The important difference between a global ministry and the WTO is that a global ministry follows the fundamental criteria. A new symbiotical relationship between religion and the protection of the global Life -support systems has begun to take place all over the world. Religious rituals now support the conservation efforts and play a central role in governing sustainable use of the natural environment. Major faiths are issuing declarations, advocating for new national policies, and creating educational activities in support of a sustainable global community. Global Community is establishing a symbiotical relationship between spirituality and science, between our heart and mind, and God, between religion and the environment. The human family is finding its role in the Universe , a higher purpose and a meaning. We now can celebrate Life. A sustainable world can be built with the help of a very powerful entity: Global Community. Community participation generates the energy needed to sustain the planet and all Life. Religious and environmental communities have formed a powerful alliance for sustainability. C. Guiding Souls and God want to help us manage Earth. We have the responsibility of managing Earth. The Earth ecosystem is so fragile that we have to manage it together wisely. Souls and God want to help us to manage Earth. They want to help us! Why would the Soul of Humanity want to help us? A very simple answer! Throughout our human history we have left behind too many dead bodies, and too much destruction. Everytime a Life form dies because of us, a Soul lost a physical form to serve God. The Soul has to find another place to serve God. If you were a Soul, would you want to serve God in a dust particle found in the empty space between the oldest galaxies of the Universe ? If you were a Soul, would you want to help humanity through the hard times ahead so you could live longer, taste Life in a human body and have a relationship with God within the physical body you are in on Earth? I believe I know your answer. Life is a much better place to be to serve God. And the human body is ' the top of the line species ' on Earth, and certainly the best Life form worshipping God in so many different ways. Earth is Heaven for God... because God becomes so happy of being conscious of such diversity of Life forms on Earth and of so many different ways to be alive in our physical Universe. We could all learn to appreciate Heaven on Earth. If Souls and God can, why cant'we? Every time our Souls are successful with us, that is when we go through Life without destroying Life around us, no conflicts and wars, then our Souls are allowed to get closer to God, and eventually enters God's Heaven. The Will of God is for Life to reach God in the best possible ways. Life is the most precious event in countless planets over the entire Universe. Life allows Souls to be conscious and worshipping God in as many different ways as possible. Life is the building block through which Souls can have a meaningful relationship with God. By observing the Universe , the galaxies, we are observing and studying God. There is more to the Universe we observe today, that is, there is more to God we observe, much more. God is self-existent, eternal and infinite in space and time. Follow God's Word. God's Plan was revealed to humanity a short while ago . The Divine Plan is the greatest hope for humanity and is now being revealed. God could not have created a Universe with billions of galaxies, each one with billions of stars such as our Sun, unless God had a plan for all Life. The higher purpose of humanity is to serve God by propagating Life throughout the Universe. Humanity will evolve spiritually to fulfill God's Plan. Soon God will show us the way to reach the galaxies. The Divine Plan is the greatest hope for humanity and is now being revealed. God could not have created a Universe with billions of galaxies, each one with billions of stars such as our Sun, unless God had a plan for Life , especially for an advanced species such as ours and countless of other species on other planetary systems throughout the Universe. We have the responsibility of managing Earth. Everyone shares responsibility for the present and future well-being of Life within Global Community. When there is a need to find a solution to a problem or a concern, a sound solution would be to choose a measure or conduct an action, if possible, which causes reversible damage as oppose to a measure or an action causing an irreversible loss. The higher purpose of humanity. If a person does anything consciously to damage or destroy the Life -support system of the Earth, the ecosystem, and if that person creates or is involved directly or indirectly with conflicts or wars, the Soul of that person is facing the Soul of Humanity. Right now! That Soul is facing the Soul of Humanity right now where all Souls are. God creates new particles in special places in the Universe , and there is a need for a Soul to serve God in all of those new particles. There is also a need to replace the good Souls living in particles between the oldest galaxies and have them come to Earth to taste Life. These Souls have been in those particles for more than fifteen billion years and yes, they will be pleased to replace these old Souls on Earth who have gotten too fat for their bellies (a figure of speech) and would rather not bother about the Earth ecosystem and the survival of Life on Earth. All Souls within the mineral and plant domains on Earth will also be asked to move up to a higher level, that of the Life forms. This process has already started a short while ago. In less than a generation a very large number of Souls will be leaving Earth forever and new Souls eager to learn about Life in all forms will be replacing them. These new Souls will learn to manage with the living. The merging of all Souls to form the Soul of Humanity may affect significantly this entire process. To manage Earth is very important because Earth is all that we have, and Earth is a spiritual entity that wants respect. Earth is most precious and the one and only place we can live for now. Earth is more than just a home - it is Heaven. God is having a good time on Earth because of the diversity of Life forms, its incredible beauty, and its magnificent 'top of the line species', us, who can adore and serve God in so many different ways. God was touched deeply by humble people from all religions on Earth. We cannot allow ourselves to let governments and other organizations take away our responsibility for managing Earth. It would be like giving the key of Heaven, our Heaven, to people who would be looking after their own self-interests and not bother with what is truly important. Over the past thousands of years, our species has gone through all sorts of loops and dead ends but we are who we are today: hopeful, imaginative, creative, demanding, powerful, diversified, changing, evolving, intelligent, resourceful, and with a kilometre length of skills, qualifications and strengths. Together we have what it takes to manage Earth wisely and keep it healthy. Together we have what it takes to manage Earth wisely and keep it healthy. Somehow we never do enough or we don't do things well enough! What is missing? Respect for Earth is missing. We think of Earth as a pile of dirt to be used anyway we wish. We don't care because we have been told that God will have us in Heaven after our death. Someone said to me: "So who cares about Earth? I am going to Heaven after I die..." . Guess what someone else said to that person..."from now on, after you die, you will be facing the Soul of Humanity, and we have just the kind of dirt or dust particle you deserve". "I am the Soul of Humanity and of all that exists on Earth. My Temple is Earth ! Not only are you thieves but you are murderers and killers. I know you all personally as your Souls are a part of me. They are my eyes. You cannot hide, and you cannot run. You are destroying yourself. The only problem is that you are also responsible for the death of innocent and humble people. Life on Earth and the rest of humanity are threatened with extinction. This is insane! You have polluted air, water and land, and you are still creating conflicts and wars. Most often the innocent and the humble people are hurt or killed. I want you to put down your guns, all of you. You will recycle all your weapons, war heads and any war equipment and products. You will stop destroying the ecosystem of the Earth right now. You will be a part of the grassroots process of Global Community. You will help to promote Global Community values and principles. Earth shall be a place of prayer and shall become a Heaven for Souls as it is for God. If we, Souls and God, can see Life as the most precious thing ever created, and we see Earth as Heaven, why cant'you? After your physical forms are dead, your Souls will separate from me and leave Earth forever. The purging and renewing of the Souls on Earth will last a millennium." If you manufacture bombs, weapons of all types, war ships, war planes, or any other types of war equipment or products, directly or indirectly, and if you provide the services of war, you voted for a leader who claimed war(or conflicts) as a way or a solution to a problem or concern, and/or if you are a soldier, a war maker or doer, then your Soul is facing the Soul of Humanity right now. And good riddance! Have a good particle in empty space between the oldest galaxies of the Universe , and you may keep it for another fifteen billion years! Your Soul will serve God right there and will never see the light again! Earth wants Peace in the world and Earth shall have it. Because of a geographical or political border, or because of some cultural or religious differences, you could not live and learn to be in Peace with the community next to you, your neighbors, and your Soul will be purged. If you are an innocent, and you die because of a war or a conflict, and you did not participate in the above, your Soul will be back on Earth to taste Life again within the 'top of the line species', ours, within Global Community and, as a Soul, you will be allowed to move up to a higher level closer to God. And God will be so much happier to be conscious of you. All the other Souls (those who live a Life for Peace and are helping Earth) will also be back on Earth and live a Life closer to God. All of you good Souls are my friends, and there is great joy and happiness in having you in Heaven on Earth. Your Souls will also be given a chance to leave the matter of the Universe forever and enter God's Heaven. If you are innocent, and you die because of a war or a conflict, and you did not participate in the above, your Soul will leave the matter of the Universe forever and will enter God's Heavens. Similarly, all the other Souls (those who live a Life for Peace and are helping Earth), after your physical forms have died, will leave the matter of the Universe forever and will enter God's Heaven. There are other pathways for Souls to enter God's Heaven but, as explained above, they are God's pathways. Many religions are also God's pathways. Earth was hurt! All Souls on Earth have unified, and they are now called the Soul of Humanity. Souls can evolve and can do a lot to heal humanity. They will resolve problems, concerns and issues peacefully. They will reinstate the respect for Earth and work together to keep Earth healthy, productive and hospitable for all people and living things. They have joined forces to bring forth a sustainable global society embracing universal values related to global rights, economic and social justice, respect of nature, peace, responsibility to one another, and the protection and management of the Earth. Everyone shares responsibility for the present and future well-being of Life within Global Community. When there is a need to find a solution to a problem or a concern, a sound solution would be to choose a measure or conduct an action, if possible, which causes reversible damage as opposed to a measure or an action causing an irreversible loss. First let us mentioned again that the Guiding Souls to serve God is a part of a new religion made public for the first time a few years ago on the websites of Global Community, the Human Family. The fundamental beliefs of the Guiding Souls serving God are as follow. Obviously, the Religion of Global Community believes in God. Now let us differentiate between the different theories on the origine of Life on Earth and in the Universe , then we will understand how and why the Global Community theory on the origin of Life over the entire Universe can only be the only possible explanation. For a century evolutionists have challenged creationists with a large amount of scientific experiments and theories. Was Life on Earth created by God six thousand years ago as described in the Bible or was it a slow and natural evolution spreading over several billion years? Most scientists dont want a supernatural being to affect Nature and rather like a Darwinian evolution which provides a mechanism for the formation of Life. Unfortunately, Darwinian evolution encounters significant problems in explaining many biochemical systems which cannot be built up by natural selection alone. There seems to be no direct mutations, no gradual routes to some very large biochemical systems. For a while the theory of Intelligent Design satisfied the creationists as it implied the inadequacy of the theory of Evolution in explaining the gradual steps of Life to its complex making. The only logical explanation was to believe in the theory of Creation as presented by the Bible. So it seems! The theory of Intelligent Design postulates that the ordering of separate components to achieve	an identifiable function depends sharply on the components. The basis of Life is the cell. The big molecules that do the work in the cell are proteins and nucleic acids. They are polymers. The building blocks of proteins are amino acids, and the building blocks of nucleic acids are nucleotides. For instance, the DNA is a nucleic acid made up of four different kinds of nucleotides: A, C, G, and T. Amino acids and nucleotides tend to associate together in almost an infinite variety of different molecules. The complexity of the problem faced by the Darwinian scheme of evolution is that evolution cannot explain the step-by-step pathways in a cell. No one can explain the origin of the complex biochemical systems in a cell. There were no biochemists on Earth several billion years ago. No laboratories either! The origin of Life appears to require an Intelligent Design to direct the complex biochemical processes. Several theories have been proposed to explain the origin of Life at that moment of time. The most succesfull one has been "la religion de l’infini". This theory does not believe in the existence of God. Le cycle du bien et la religion de l’infini. Dans ce document, Lise nous fait part de sa compréhension des messages en regard des prémisses, des principes et des avenues de la religion de l’infini. C’est un texte historique qui découle des messages que les Élohim ont donnés à notre humanité par Yahvé, le président du conseil des éternels Élohim, en 1973-75-78. Ce texte marque l’histoire spirituelle de notre planète. Grâce à sa lucidité, Lise nous fait comprendre enfin ce que les Élohim ont voulu nous dire expressément dans leurs messages concernant notre individualité et notre humanité en lien avec l’univers infini. Les Élohim nous demandent de suivre leur spiritualité en lien avec la conscience cosmique. À vous de prendre le chemin tracé par les Élohim. Dans le Notre Père, nous disons : « Que votre volonté soit faite sur la terre comme au ciel. » Nous en comprenons aujourd’hui tout le sens… Victor LeGendre, président du Mouvement d’accueil des Élohim. Ce dernier, président du conseil des éternels Élohim, représente les Élohim qui sont les créateurs de la vie sur terre. La Bible en fait abondamment mention. Dans cette révélation, Yahvé affirme notamment que dieu n’existe pas dans l’univers infini et que l’être humain a un pouvoir énorme de faire exister le bien ou le mal. En effet, par rapport à ce dernier point, toutes les consciences, dans leur orientation au sein de l’univers, sont éternellement confrontées à choisir entre ces deux voies qui représentent l’orientation spirituelle de la conscience dans l’infini. Cette connaissance vient d’une civilisation extraterrestre très évoluée spirituellement et scientifiquement. Elle représente toute la sagesse dans notre monde et dans l’univers. Dans les faits, ils sont les extraterrestres les plus évolués du cosmos, n’ayant jamais rencontré une civilisation plus évoluée spirituellement ou scientifiquement que la leur. Comme créateurs, les Élohim ont un ascendant sur nous sur le plan moral, tout comme nos parents, durant notre enfance, ont bénéficié d’un ascendant moral sur nous. Nous sommes leurs enfants à l’échelle cosmique. Comparés à eux, nous sommes peu évolués sur les plans spirituel et scientifique. En raison de toutes leurs connaissances et de leur avance spirituelle et scientifique de plus de 25 000 ans sur nous, ils possèdent toujours une notoriété sur nous." 3 Les messages sont contenus dans 3 livres que le prophète Raël a reçus et publiés à l’Édition du Message et à la Fondation raëlienne. Le 1er Le Livre qui dit la Vérité (1973). Le 2e Les extra-terrestres m’ont emmené sur leur planète (1975) et le 3e Accueillir les Extra-terrestres (1978). I l faut voir le pdf document pour lire tout le message. The reader can make his or her own choice of religion. Global Community religion has taken a different path to explain the origin of Life. For instance today a biochemist can easily synthesize the components of nucleotides by first purifying and then allowing them to recombine through chemical reactions. Several billion years ago undirected chemical reactions most often produced useless products. The proponents of the theory of Intelligent Design concluded that it was becoming more obvious that the complex biochemical systems of Life were not put together gradually but rather quickly. The designer knew what the complex biochemical systems would look like. The systems were designed by an intelligent agent. Life was purposely arranged. So it seems! Global Community proposed that the laws of nature can organize matter to build complex biochemical systems that are at the origin of Life forms such as a complex human being. The most relevant laws are: biological reproduction, natural selection and mutation. The evolutionary process has been active from the beginning. And each particle of matter has a Guiding Soul. All biological structures can be explained in terms of those natural laws and the Guiding Souls serving God. The existence of Souls does not necessarily imply a special beginning of the Universe. The Universe , as we know it, may have never had a beginning and probably never did. Souls can only guide the matter of the Universe to serve God. "La Cosmologie et la Cosmogonie: Une Discussion"
Even if the Big Bang was 100% correct, it could also be that the observable Universe is a part of an even larger, infinite, Universe. That is more likely to be true. God is infinite in space and time and could have created our observable Universe for a higher purpose. The physical Universe is a part of God. God is conscious of us through our Souls. Most Souls today are not as they were at the beginning of the Universe. That is if there was such beginning. Let us say that at the beginning of our observable Universe , there was the Primeval Atom or Big Bang. Souls have merged and evolved ever since this beginning. The Primeval Atom was made of the pure light of God, which today we call Guiding Souls. Then God allowed the Primeval Atom to explode and space, time and matter were formed and the Universe evolved as we observe it today. Souls do their work at all times and everywhere over the entire Universe. This is especially true during the formation of stars. Stars are formed when a large cloud of dust particles collapse on itself by gravitational forces and other physical phenomena which may affect their characteristics. Then a star, and planets with their moons, if any, are formed. After being born a star system has a Life time of its own. For instance, our Sun is believed to be about six billion years old, a young star really! Souls continue to do their work at all times during the formation of a new star system. It is very likely that there are billions of star systems with planets in our observable Universe. Souls would have guided matter to create such systems to better serve God. The ultimate goal is the creation of Life on a planet. Life allows Souls to be conscious of God in many different ways, and thus better serve God. Now imagine a large cloud of dust particles and each particle has a Guiding Soul. As the cloud becomes a Star and planets, Souls start merging together. The star itself, like our Sun, becomes a single, unique Soul serving God. The Sun spreads its light, its energy all around, DIVINE LOVE and DIVINE WILL, helping Life to be formed on Earth. Earth itself also became one unique Soul to better serve God. At the early stage of this expanding Universe , every particle in the Universe had a Soul each being a small part of the primeval consciousness of God. Each Soul was the essence of a small part of God's Spirit. In a way, the essence of each Soul is God Spirit. This is because God exists everywhere in the Universe and in every particle of all galaxies. Souls have an important intrinsic quality, they can merge together, a group of Souls can become one Soul, a brighter one, different. This is what Souls do best, and it is to unify to better serve God. Souls can evolve as well. A Soul's primary goal is to serve God. A Soul can affect matter to some extent so as to achieve God's Will. At the early stage, when the Earth was formed, and a while later, all the conditions for the formation of Life were present, and Life was formed to better serve God. Life was made of matter and every particle of that matter had a Soul that merged with all the others. That first spark of Life had a unique and independent Soul, and its own Spirit, to better serve God. Throughout the different evolutionary stages of Life on Earth, Guiding Souls have guided the step-by-step evolution of Life on Earth and kept merging to better serve God. Guiding Souls have guided the step-by-step evolution of Life on Earth. Life exists on millions of other planets in the Universe , and our species got to be who we are today through the evolutionary process just described. Other Life forms in the Universe may have evolved to be at least as advanced as our species. Their Guiding Souls may even be more complicated than ours. They may have merged a trillion times more than our Souls. They may have evolved as well. F. Is humanity as we know it today on Earth our final destination? To be purified means a Soul loses all of its attributes as a Human Soul. Then the Soul will be asked to serve God in a particle in the empty space between the oldest galaxies of the Universe. There will be no interaction with an other particle. The Soul will never see the light again. It was necessary for our species to reach today's population of 7 billions in order to leap to our next stage of evolution that will bring us closer to God and propel humanity to fulfill the Divine Plan. Heaven on Earth and God's Heaven! Liberating Souls from matter to bring humanity to God's Heaven! How was the Soul of Humanity formed? Why do People today have different religious beliefs? What can religion do today to help manage Earth? Religious beliefs with respect to Earth Management were issues discussed in a Discussion Roundtable during Global Dialogue 2002. In many ways religious beliefs affect Earth Management, and we want to discuss their importance. We started this discussion during the World Congress, and again in August 2002. During the World Congress , Global Community has extended the idea of sustainability to be a moral and ethical state as well as an economic and environmental state. We may find that religious beliefs have always been beneficial. I dont know! We invite everyone and every organization to participate openly without fear. We have asked everyone throughout the World Congress to scrutinize all of our values. No exception! You were asked to create new thoughts that will sustain Earth, humanity and all Life. Again I will not claim here to know all about religions or be an expert on the fine words writen by past famous religious leaders and Prophetes. They are not my religious beliefs, and it is not up to me to talk about theirs. I think of myself as a humble person and, as such, I will express my own religious beliefs, and how they may affect Earth Management. I do not belong to a Church or a religious organization and will never do so. I believe in God and more, as you will see next. I deal with God and my religious beliefs in the most satisfying ways that makes a lot of good sense in my Life. This process will help humanity to think clearly and globally. Your research papers, brainstorming exercises, Vision statements, discussions, comments and recommendations will be well appreciated and reviewed. They will give us a sense of direction and purpose. The end product will also include universal values to connect us together as we all belong to Global Community. From the experience in your Life. .. well!... I have already described my own Life experience in an article of the December 2000 Newsletter. Today I clarify and expand on some of the ideas described in the article. I will only describe my own religious beliefs and how they may help managing Earth. They go along with the movement for Peace in the world. These are my own personal thoughts and are not to be confused with any other religious beliefs that may seem similar in essence. How could religious beliefs be of importance to sustain Earth, humanity, all Life , our environment on the planet? Imagine the state of the Universe at the time of its creation. You could assume that the beginning of the Universe was an explosive kind as described by the Big Bang theory of the Universe. But it could have also been another type of beginning. The following explanation about the formation of the Soul of Humanity would still be true no matter whether the theory of the original primeval atom is true or not. Because of the amount of experimental data pointing at or proving the Big Bang theory, we will assume here that it was such a beginning. Imagine the Universe the first few seconds after its explosive phase. The Primeval Atom split into its fundamental particles, the kind we observe today in large quantities. These particles expanded in all directions. Space and time were also expanding with the matter. A cosmic time later, dust particles throughout the Universe gathered together to form stars and planets. Galaxies were forming and still expanding in all directions. Another cosmic time later, our galaxy was formed, the incredibly beautiful Milky Way, and our star, the Sun, with all of our planets, with the Earth and its multitude of lifeforms. As was explained in the December 2000 Newsletter, God created Souls. The physical Universe we observe is a part of God. God is conscious of us through our Souls. A Soul will not try to control us. A Soul accepts us as we are. We can have a close relationship with our Soul and live a Soul Life. Every Life form on Earth has a Soul as well. All minerals and plants, every particle in the Universe has a Soul (but usually Souls will merge or unify to become different groupings to better serve God). This is because God exists everywhere in the Universe and in every particle of all galaxies. God is conscious of the Universe through Souls, and we are conscious of God because of Souls. There are many unanswered questions about Souls and God, and the human heart and mind are still exploring many possibilities. We will never find all of the answers. And, obviously, we can never travel back to our past or forward to our future. That is impossible! Because God is so powerful, and because we are so human and so weak, we try to make demands on God. I have done so many times myself. God let us live and die, and it is up to us to have a relationship with God. God lets us be free. We are free to make choices between an infinite number of possibilities at each instant throughout our lives. That is why we could never repeat exactly the same Life all over again, even given the same original circumstances. We are free to decide between right and wrong. We are free to grow spiritually and live better lives with our Souls and God. God does not tell us what to do or what not to do, nor does our Soul. Except when Souls want to leave the matter of the Universe forever to enter God's Heaven, then God will show us the way. Otherwise, we are truly free! Once a Soul has merged and evolved enough, the Soul will want to enter God's Heaven. Then the Soul must follow God's pathway to God's Heaven. The Soul will have been purged or purified before entering God's Heaven. You can connect with God just by yourself! Just think of God, and there is God for you. Simple! Our Soul can also help us make contact with God. God does not belong to any particular religious institution. God does not belong to anyone in particular. God is self-existent. The physical Universe is a part of God. God is conscious of us through our Souls. The peoples of all Nations, in creating an ever closer Global Community among them, a Global Civilization, are resolved to share a peaceful future based on common values. Conscious of its spiritual and moral heritage, Global Community is founded on the indivisible, universal values of human dignity, freedom, equality and solidarity; it is based on the principles of democracy and the rule of law. It places the individual at the heart of its activities, by establishing Global Community citizenship, and by creating an era of freedom, security, global justice and social harmony. Global Community is a non-hierarchical nonviolent organization of individuals and organizations that promotes the arts, conducts workshops, facilitates nonviolent direct actions, educates, organizes, campaigns, empowers, and aims to rip injustice from its roots. We are committed to nonviolence. We stand for the globalization of our rights to speech, thought, religion, assembly, a clean environment, self-determination, freedom from fear and persecution and freedom from poverty. We stand for the rights of women, children, elderly, affordable health care, strong labor rights and social and economic policies that put people and the environment before profits. Global Community is the new Faith and Religion of the 3 rd millennium. Global Community includes all Life everywhere in the Universe. Global Community claims that everyone on Earth should be able to live in Peace. This Global Peace Mouvement is about courage to live a Life in a harmonious peace order and showing by example, thus preventing poverty, wars, terror and violence. We need to educate the coming generations with good principles, being compassionate, social harmony and global sustainability being some of them. Conservation, restoration, and management of the Earth resources is about asking ourselves the question of "Who owns the Earth?" The large gap between rich and poor is connected to ownership and control of the planet's land and of all other Earth natural resources. We, Global Community, must now direct the wealth of the world towards the building of local-to-global economic democracies in order to meet the needs for food, shelter, universal healthcare, education, and employment for all. Global Community has proposed a democracy for the people based on the fact that land, the air, water, oil, minerals, and all other natural resources rightly belong to Global Community along with the local communities where those resources are found. The Earth is the birthright of all Life. The Global Economic Model proposed by Global Community is truly the best response to the world . Global Community is defined around a given territory, that territory being the planet as a whole, as well as a specific population, which is Global Community. Global Community has the power to make the laws of the land and to make the rules for the territory of the Earth. Global Law has been and continue to be researched and developed for this purpose. We are all members of Global Community. We all have the duty to protect the rights and welfare of all species and all people. No humans have the right to encroach on the ecological space of other species and other people, or treat them with cruelty and violence. All Life species, humans and cultures, have intrinsic worth. They are subjects, not commodities, not objects of manipulation or ownership. No humans have the right to own other species, other people or the knowledge of other cultures through patents and other intellectual property rights. Defending biological and cultural diversity is a duty of all people. Diversity is an end in itself, a value, a source of richness both material and cultural. All members of Global Community including all humans have the right to food and water, to safe and clean habitat, to security of ecological space. These rights are natural rights, they are birthrights given by the fact of existence on Earth and are best protected through global community rights and global commons. They are not given by states or corporations, nor can they be extinguished by state or corporate action. No state or corporation has the right to erode or undermine these natural rights or enclose the commons that sustain all through privatisation or monopoly control. After defining Global Community expression, Virginie and I thought we would better serve humanity by first Celebrating Life because Life is what allows us all to be who we all are and to have symbiotical relationships between ourselves, and between ourselves and the Soul of Humanity and God. Life often involves tensions between important values. This can mean difficult choices. However, we must find ways to harmonize diversity with unity, the exercise of freedom with the common good, short-term objectives with long-term goals. Every individual, family, organization, and community has a vital role to play. The arts, sciences, religions, educational institutions, media, businesses, nongovernmental organizations, and governments are all called to offer creative leadership. The partnership of government, civil society, and business is essential for an effective global governance based on global concepts such as the Scale of Global Rights. Let our time be a time remembered for the awakening of a new reverence for Life , the firm resolve to achieve sustainability, the quickening of the struggle for justice and peace, and the joyful celebration of Life. Let our expanding consciousness blend with that of the Soul of Humanity. Being unified under the Soul of Humanity dissolves all barriers and expand our global consciousness. We become more whole and complete within ourselves and as a group. Our common Spirit is able to resolve planetary problems in a coherent way. One common 'Global Vision' allows us to see how all the parts of the whole relate to each other. We have the right relationship with one another, with all Life forms and Earth itself, and with the Soul of Humanity. On May 26 of each year, let us all celebrate Life in our heart, mind and Spirit. Let us thank God for the gift of Life. Perhaps now is time to elaborate on my teaching as your spiritual leader and Prophet of God. I am asking all religions around the world to re-examine their scriptures, precepts, practices, ethical and moral values in light of ecological concerns. Global Community is facing a global environmental crisis. It is very important that every person on Earth accept of being part of the process in protecting the global Life -support systems. The ecological crisis is as much about saving children as it is about saving other Life forms on the planet. Our first objective will be to find statements from all religions that promote the respect, stewardship, protection, ethical and moral responsibility to Life and of the environment, the Earth global Life -support systems, and statements that promote a responsible Earth management. I am also asking for specific statements on environmental conservation. I ask people from all religions to participate. The work of Global Community, the global civil society, and the determination of government worldwide, make it possible for everyone to comply with the law. Building global communities requires a mean to enforce Global Law for the protection of Life on Earth. Global Civilization guides humanity for the building of global communities. This is a great opportunity for globallateralism. Global Law includes legislation covering all aspects of human activities. The Global Protection Agency (GPA) will train and lead a global force, bypassing traditional peacekeeping and military bodies such as the United Nations and NATO. The GPA will enforce the law. And that is the third option we offer Global Community. And that is also how we can stop the global warming of the planet and protect the global Life -support systems, thus largely improving the quality of Life of the next generations. I believe that there is no greater task in the world today than for Global Community to proceed through the maturation of its leadership, emerging from a more self-interested adolescence as a global leader into a nobler adulthood. We have the potential to act as a torchbearer for a better tomorrow. Do we heed the call? I hope this message has convinced at least a few people that the question of how to proceed with that maturation is of far deeper significance than the reforming of the United Nations. I thus pray that we move with wisdom, grace, clarity, and love in the days, years, and even decades ahead. Global Community has made clear that globalization and planetary trading blocks should be serving the Human Family and not the other way around, the people around the world serving the very few rich individuals. Conflicts and wars in the world are often the results of bad trading of arms and oil and the absence of moral responsibility and accountability in our way of doing business with the Middle East nations. By applying proper moral safeguards and accepting responsibility and accountability of all products (arms and oil in this case), from beginning to end where they become wastes, each corporation would make free trade and globalization serving the Human Family. Over its long past history trade has never evolved to require from the trading partners to become legally and morally responsible and accountable for their products from beginning to end. At the end the product becomes a waste and it needs to be properly dispose of. Now trade must be given a new impetus to be in line with the global concepts of Global Community. When you do exploration work, develop, manufacture, produce, mine, farm or create a product, you become legally and morally responsible and accountable of your product from beginning to end (to the point where it actually becomes a waste; you are also responsible for the proper disposable of the waste). This product may be anything and everything from oil & gas, weapons, war products, construction products, transportation and communications products and equipment, to genetically engineered food products. All consumer products! All medical products! All pharmaceutical products! In order words, a person (a person may be an individual, a community, a government, a business, an NGO, or an institution) becomes responsible and accountable for anything and everything in his or her Life. No more waiting! Time for action is now! We are all responsible for the creation of global warming, and there are plenty of observable effects. Greenhouse gases are accumulating dangerously in the Earth's atmosphere as a result of human activities, and temperatures are rising globally due to these activities. Climate changes have to be manage without delays and the ratification of the Kyoto Protocol is only the beginning of a long fight for the protection of Life on Earth. There is much more to be done to even come close to what we have to do. The ratification of the Kyoto Protocol was only the beginning to help save the next generations. Global consumption is a very important aspect of globalization. Consumers should be concerned with the impact of their decisions on the environment but also on the lives, global rights and well-being of other people. Since one of the key functions of families as a social institution is to engage in production (selling their labour in return for wages) and consumption (using those wages to buy goods and services), then the role of families has impacts on sustainable consumption and development. Corporations are required to expand their responsibilities to include global rights, the environment, community and family aspects, safe working conditions, fair wages and sustainable consumption aspects. Global Community has summarized the rights of every person on Earth by developing the Scale of Global Rights. The scale will eventually be replacing the Universal Declaration of Human Rights. The Global Constitution established all rights. Just as corporations have social responsibilities and so do consumers in societies. Consumers are socialized to improve the quality of their lives. Quality of Life is a multi-dimensional, complex and very subjective concept. For instance, someone who has changed their consumption habits to better ensure that their choices will make a better quality of Life for themselves, the environment and future generations, may be seen by others as having a lower or inferior quality of Life since they have removed themselves from the materialistic mainstream characteristic of our consumer society. Someone may feel that an absence of violence and abuse in their Life leads to a higher quality of living even though they have fewer tangible resources, money, or shelter; peace of mind and freedom from abuse has increased the quality of their daily Life relative to what it was like before. There are universal quality of Life values which lead to "human betterment" or the improvement of the human condition. In addition to the value of species survival (human and other living organisms), they include: adequate resources, justice and equality, freedom, and peace or balance of power. A better quality of Life for all global citizens is a goal for all of us and one of our universal values. Global Community is creating a global civilization based on a just and tolerant society giving everyone the opportunity of becoming a global citizen. Global Citizens are concerned about global issues since 1985. This ends my teaching for now. More will come later. 6. The stewardship of the ecological base is the essential prerequisite for the effectiveness and exercise of all rights recognized for human beings, and it has to be given priority before the fulfilment of various economic and social wishes. Demands resulting from the socio-economic system of a particular country have to find their limits in the protection of the global ecosystem. Vital interests of future generations have to be considered as having priority before less vital interests of the present generation. All Souls involved with the careless destruction of the Life -support system of the planet, directly or indirectly, shall face the Soul of Humanity to be purified. I. I AM THE LORD THY GOD, THOU SHALT NOT HAVE strange gods BEFORE ME. IX. THOU SHALT NOT COVET THY NEIGHBOR'S WIFE.